Virgin Hyperloop One is among a number of businesses developing hyperloop systems. The hyperloop is a revolutionary technology that will dramatically cut travel times between cities. Virgin Hyperloop One has a lot of money behind it - $295 million from Sir Richard Branson's Virgin, GE Ventures and SNCF. The company has already built a proof of concept vehicle. It's been successfully tested. The "pod" levitated, accelerated, glides, breaked and came to a stop. The company continues to move the technology forward. 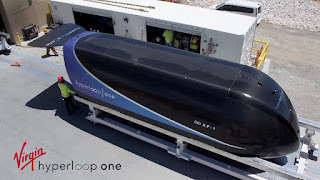 Virgin Hyperloop One uses magnetic levitation to lift the train or pod above the tracks. Electric propulsion accelerates it through a low pressure tube. The vehicle is capable of gliding at airline speeds. The promise of this technology is to go 700 to 800 mph. Elon Musk originally introduced the concept of hyperloops. Virgin Hyperloop One says it has made substantial changes to his original concept and plan. The company is very optimistic about rolling the technology out. And there are a lot of benefits: it's an autonomous, enclosed system with no carbon emissions and it cuts travel time, for instance, from LA to San Francisco down to 43 minutes. More work needs to be done to bring these systems into widespread operation, including longer lasting batteries for longer distance trips.